"Season 2 is amazing. I get surprised reading the script as the puzzles come together. If Season 1 was about dropping bait, in Season 2, the foreshadowing is remembered. The drama is full of surprises and it's like the second half of a football game", said Ryu Seung-ryong of Netflix drama "Kingdom". When he was asked to talk more about the next story, he smiled. He didn't go into detail because he swore not to leak the story, but he did seem excited about it. "If the drama can afford it, I wish the seasons continue and [the story] ends up in the present". "Kingdom" is the first Netflix drama created in Korea. Ryu Seung-ryong rarely smiles in the drama. He plays Jo Hak-soo, the prime minister during the Joseon Dynasty and the true authority behind the king who manipulates the country to his will. The greedy, heartless man uses his young daughter as a royal puppet and revives the recently passed king in dubious fashion to quench his thirst for power. In fact, his greed is the root of the plague: he creates patient zero of the outbreak. "He's an extreme character. I think he becomes a monster because of his wrong beliefs. I suppressed my emotions rather than allow them gush them out. He's scary with just his beliefs alone". Not all the questions from Season 1 have been answered. Ryu Seung-ryong laughed when he was asked about the relationship with Lord Ahn Hyun (Heo Joon-ho) from 3 years ago. The making of "Kingdom - Season 2" begins on the 11th. He looked excited. He said, "I am proud to say I am a part of a new epic undertaking". Working with Netflix is a special experience. "We broke the line between the drama and the movie, and we put together all the good points", he said proudly. "Kingdom" has been dubbed in English, Japanese, and Chinese. The creation of the poster and the lack of the live ratings system was new for the production and dramaland. "The making of the drama wasn't much different from the set of a movie. I did feel the difference in the work of the latter half". Korean historical work/sageuk is Ryu Seung-ryong's specialty. He's a comic actor in films like "Extreme Job", but his deep and heavy voice suits sageuk well. He's been in several sageuks like "Arrow, The Ultimate Weapon", "Masquerade", "The Admiral: Roaring Currents" and more. He did the talchum (traditional masked Korean dance) in the Seoul School of Arts and he was in the samulnori (percussion-based) dance performance "Nanta" for 5 years. His interest in and related experience of traditional culture also coincides with the color of "Kingdom" set in the Joseon Dynasty. He made an example of the scene during which he speaks to his daughter, the Queen (Kim Hye-joon), in the drama. 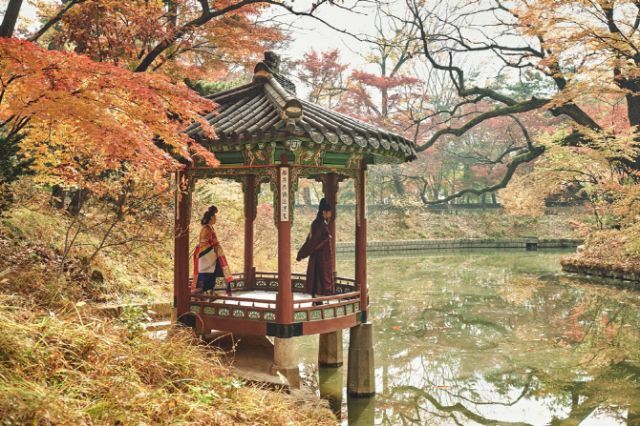 The scene was shot in the Secret Garden of the Changdukgoong under the yellow, orange, and red maple leaves where they plotted evil and discussed bodies in the quiet, reflective pond. The beautiful scenery contrasts with the cruelness of the drama. "There are foreign viewers of the drama too, and I hope they realize the beauty of Korea through "Kingdom"", he added. The actor claims he's afraid of zombie movies. The actor seems friendlier knowing that he's usually known for his rough and tough characters in most of his works. When we asked him for a line from the movie "Extreme Job", he repeated, "There has not been a flavor like this before". "I always wonder what the audience wants. I strive to connect with them to find out what they want". "[Interview] Ryu Seung-ryong "Kingdom - Season 2" Will Round Out Series"